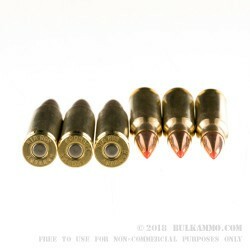 The 308 Winchester round was developed in 1952 for the hunting market. Two years later, NATO adopted the 7.62x51 cartridge which is quite similar to the 308 Win. The 308 Win round has been innovated since then and continues to be one of the most popular hunting and tactical rounds in the world. Hornady designed their Superformance line to exceed the usual speed of the given cartridge and impart more terminal effect into the target. The Hornady Superformance line up runs about 100-200 feet per second faster than the same round in that caliber by using specialized powders. 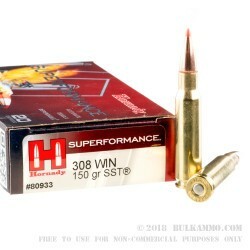 The Hornady Superformance 308 150 grain SST or Super Shock Tip was designed just for medium to large sized game animals. This 150 grain Hornady 308 SST uses non-corrosive high polished Boxer primed brass cases that are reloadable after they’re fired. 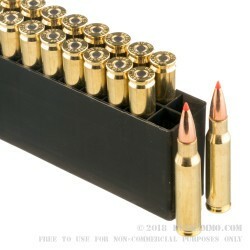 These rounds push a massive muzzle velocity of 3000 feet per second and hit hard with a muzzle energy of 2997 foot pounds. 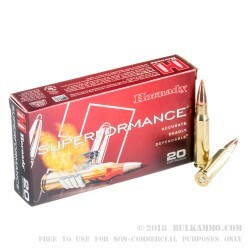 This .308 rifle ammo comes ready to shoot in a package that has 20 rounds per box and 10 boxes per case, giving you a grand total of 200 rounds. This bulk pack gives you enough ammo to sight in your rifle for your next hunting trip, take it out to the target range, or just test the function of that new action you just bought. Get yours today.